i-Buddy is specially designed for Windows Live Messenger (MSN Messenger) users. It is a physical representation of your buddy. You can program it to recognize a particular buddy account, and it will response to all messages and status events sent from your buddy. 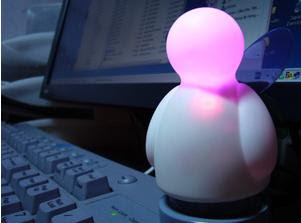 It is a 3-inches tall figurine connected to the computer using a USB cable. Specially designed in tiny size, so that it does not consume much space while you are at work. You can put it on top of your monitor too.